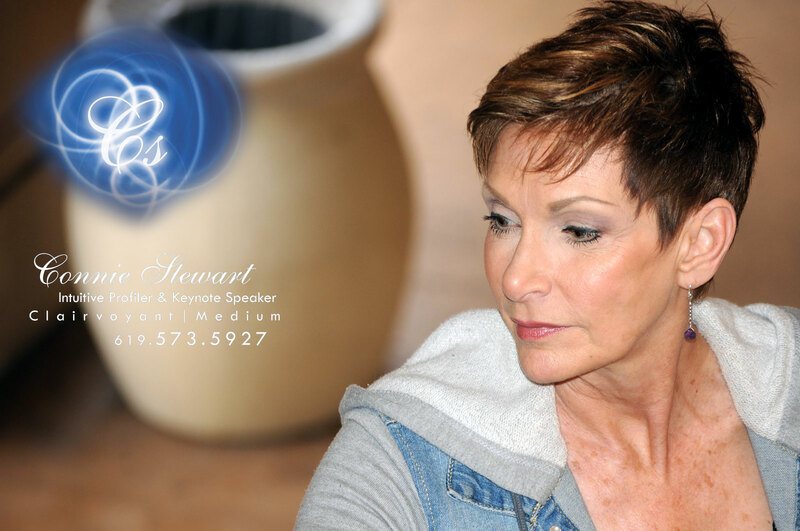 Hillcrest clairvoyant and medium Connie Stewart began life by closing her eyes to her surroundings. Once, Stewart literally lost her sight for a while, when her alcoholic father beat her about the head. There, floating in the ether amongst her “twinkling friends,” Stewart knew her spirit was safe: a “quiet, soft, normal” feeling she otherwise only felt at her grandmother’s house. After her father threw her out as a teenager, her life became conventional. She married, had a son and left the bayou to work in a corporate environment. Occasionally, she would experience a “random and chaotic” sixth sense – knowing, for instance, that someone was about to die or a disaster was going to happen – but it was more frightening than empowering. Until then, no one had ever spoken those words aloud. Not even Stewart herself. “It was a defining moment,” she said, and she interpreted it as “permission” to begin investigating and developing her abilities. But Stewart was still afraid and conflicted. It wasn’t just that her father had tried to annihilate her for the “something in my eyes that he couldn’t understand,” she said. She also feared becoming “crazy” like her mother. “Mama was either crying or eerily silent most of the time,” Stewart remembered, and whenever she was about to have a mental breakdown, she would rock in her chair and sing the same song over and over. Stewart still shudders at the memory. Yet while she could keep her psychic visions at bay during the day, when night fell they arrived in the form of dreams. “There were shaman, medicine men, and a lot of mystical people from times gone by,” she said. At first she was terrified, but then it hit her: she was being shown that she was one of them. Realizing that she had a previous life as a healer, Stewart was growing excited about her powers. But she said her husband was horrified. Just as her father had been, he feared she could see through him and accused her of reading his mind. This time, though, Stewart could neither suppress nor ignore the internal process that was in motion or, for that matter, the objects that were moving around on the outside. “I was sitting in my car … when all of a sudden … a tree branch fell on the hood. But [there wasn’t] a tree in sight,” she said. Kleenex boxes, water bottles, books: they were all moving – seemingly of their own volition – and Stewart was petrified. But the woman wasn’t alarmed. She assured Stewart it was not spirits or ghosts, but her own energy, or gift. It was then that Stewart decided to find a mentor. “I said to my husband, ‘I need to find somebody who has all the abilities I have but who knows what to do with them,’” she recalled. Within an hour, the phone rang. It was a woman from her hometown in New Orleans, a clairvoyant medium and healer she’d met only indirectly once before, inviting her to attend a workshop. But when Stewart’s husband learned his wife planned to spend two weeks studying with a psychic, he threatened divorce, she said. It was an ultimatum that gave Stewart pause. Torn, she hesitated. If she studied with the mentor, not only would she risk losing her husband, she’d also have to travel back to Louisiana, deep into the forest to connect with the energies her father had tried to exorcise years earlier. Rather than continue to be afraid of her gifts, however, Stewart was determined to learn to summon them at will. She accepted the adventure that beckoned. Pursuing the path toward her heart’s desire felt glorious, yet returning to her husband, who remained resistant, was heart breaking. Convinced she needed to be “free on a soul level,” Stewart decided to abandon both married life and her corporate career. For the next five years, before opening SoulSync in 2002, Stewart read part time for clients. Financially it was a struggle and, at first, she also held a part-time job. But she soon found she needed to devote all her energy to honing her skills. Dream interpretation, remote viewing, energetic space clearing: such services require regular retreats into her “inner forest” to commune with spirit guides and replenish healing energies, she said.